Now that I seem to be making custom watercolor brushes in Photoshop on a weekly basis, I thought it might be helpful (and fun) to show you how I do it. I fully understand there are other ways to make brushes, but this is what works for me! Let me be clear that I don't consider myself an artist. I LOVE experimenting with art supplies, but if you asked me to draw your face I would probably fail. I'm good with the simple stuff :: lines, shapes, lettering, etc. For this exercise, that's all you really need. Begin by painting your watercolor elements. 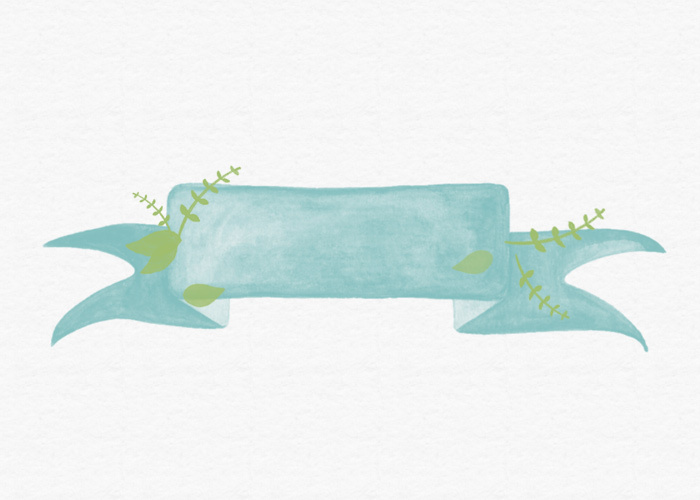 If you plan on making flowers, paint each part separately: stem, leaf, petals, etc. Keep them spaced evenly (like cookies on a tray); this will allow for easy cropping later on. Use a single color, and don't worry about making fancy gradients or mixing colors. Tips + Tricks :: Use black watercolor because it shows up best in scans. Image > Mode > Grayscale. Image > Adjustments > Levels. By moving the right Input Level arrow to the left, you'll see the "background specks" start to disappear. Your goal is to have a dark image on a white background. The more contrast, the better. (There are other ways of achieving this, but in my opinion this is the easiest/fastest method.) At this point, I recommend saving this as a .jpg (at max resolution) for future use. Give it a specific name like "flowerbanner_scan_edited.jpg." Next, isolate the first element you want to use for a brush with the Crop tool. In this case, it's my banner. Leaving width and height blank, keep the resolution at 300 (or higher), then click "OK."
Crop the element leaving minimal white space around it. Edit > Define Brush Preset. Let's try out the brushes. Create a new file. Create a new layer. (I made Layer 1 white so I could see what I was doing.) On Layer 2, use the brush by selecting...the Brush tool. Make sure the brush is the right size, then place it where you want it. Tips + Tricks :: Even if you plan on applying a brush on an edge (so that it's partially cut off), start by placing it in the center then move it to where you want it. This gives you maximum flexibility if you want to move it later. Brushes are different from shapes in this way: Photoshop will only save the pixels visible on the canvas. To apply color or gradient to the brush, make sure Layer 2 is selected, then choose Color Overlay or Gradient Overlay from the fx dropdown in your Layers panel. 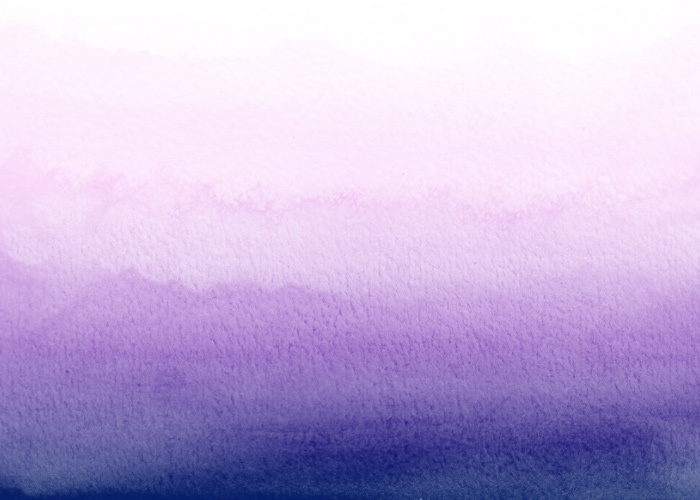 Try out some gradients that mimic watercolor. Layer the brushes to create your composition. 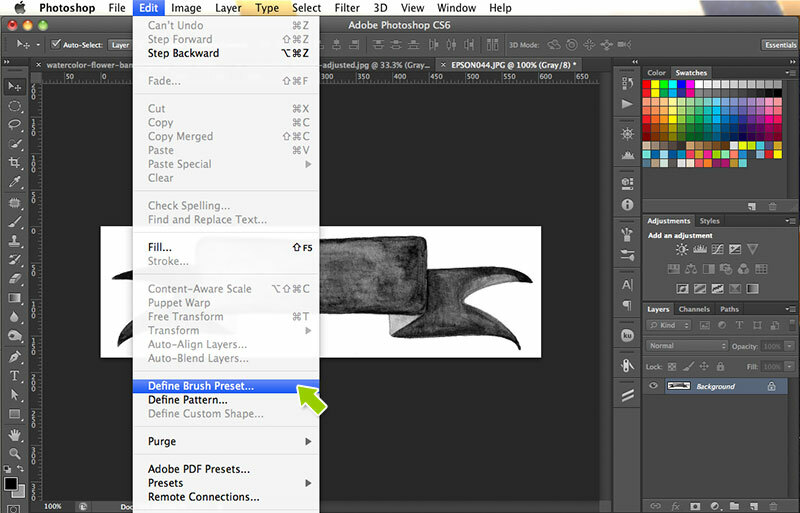 Keep each brush application on its own layer so you can easily move and edit everything. Ta-da! Photoshop brushes give you the best of both worlds :: on the one hand, you get to work from original art, but on the other, changing color, size, and placement is easy. After you get the hang of things, try experimenting with textures, backgrounds, and other shapes. By adjusting the gradients, your options are truly endless!